Blade Auto Center, the country’s largest automotive accessories and lifestyle store, is set to tap another segment of the automotive market with Tamiya. With literally hundreds of plastic model kits, radio controlled cars, battery- and solar-powered educational models, sailboat and airplane models, acrylic and enamel model paints, and various modeling tools and supplies, Tamiya products are known worldwide. With retail outlets in SM and Robinson’s Mall nation-wide makes Blade Auto Center the perfect venue to sell such premium hobbies. “This is an opportunity for hobbyists to gain more access to the Tamiya brand anywhere around the country,” says Robertson Sy Tan of Blade Auto Center. One of their goals is to reintroduce the popular and highly competitive mini 4WD in all Blade outlets. The Mini 4WD is a miniature model within the mini scale of between 1/20 (1:20) to 1/48 (1:48) scale. This mini sports utility is easy to assemble and use, and powered by a AA battery that requires no remote control. All four (4) wheels are direct-drive, thus “4WD” for 4-wheel drive, as opposed to “AWD” or All-wheel drive. Horizontal side rollers guide the vehicle against the vertical walls of the un-banked track for steering, providing very fast speeds up to 65 km/H (40 mph) on the track. In Japan, Mini 4WD is also known as mini yonku in Japanese. Though mostly popular in Asia, they are sold in many countries such as Japan, Taiwan, Hong Kong, South Korea, Philippines, Thailand, Indonesia, Malaysia, Italy, United States and the Netherlands. “We are excited about this partnership and I am sure that it will expose the hobby to more people,” adds Justin Uy, authorized dealer of Tamiya in the Philippines. In the Philippines, Tamiya is officially distributed by Lil’s Hobby Center with branches at SM Megamall, Glorietta 2, and West Drive Kapitolyo. Also present at the launch were mini 4WD enthusiasts and hobbyists who traded parts and raced at an indoor track set-up by Tamiya. 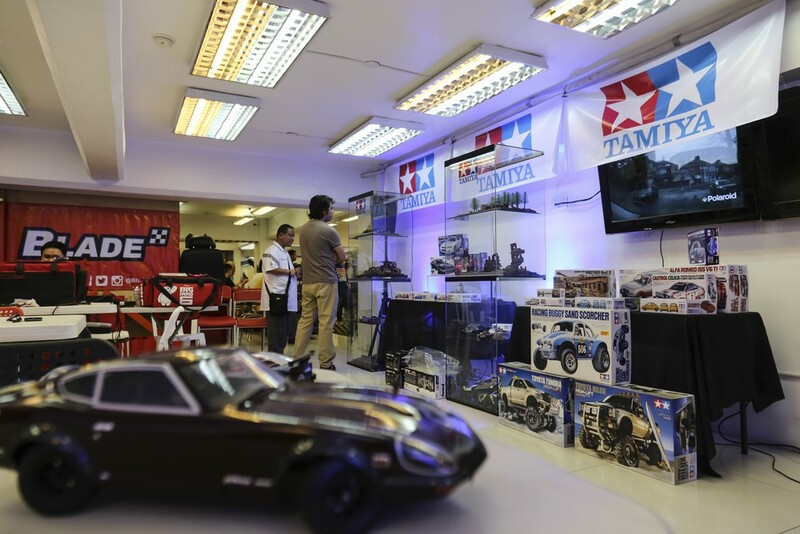 The Tamiya product launch was held at Blade’s corporate office and showroom along Timog Avenue, Quezon City. Established in 2004, Blade Auto Center is the largest chain of car accessories shops in the country with over 50 locations nationwide. Known as the alternative venue to “Banawe”, a popular car accessories and parts area in Quezon City, Blade is a convenient alternative due to its location, whose stores are strategically spread nationwide in most SM, Ayala and Robinson’s malls. As an automotive lifestyle store, Blade Auto Center offers everything you need to accessorize your ride, from audio, video, detailing products, dash cameras and motor oils among others. To get the latest updates about Blade, go to www.BladeAsia.com or visit their Facebook and Instagram accounts (@BladeAutoCenter).